Wild parties, private liquor stashes, and all-night dancing. Nothing reminds us of the 1920s quite like a flapper party! It may not have been all sunshine and rainbows, but they sure knew how to have a good time. 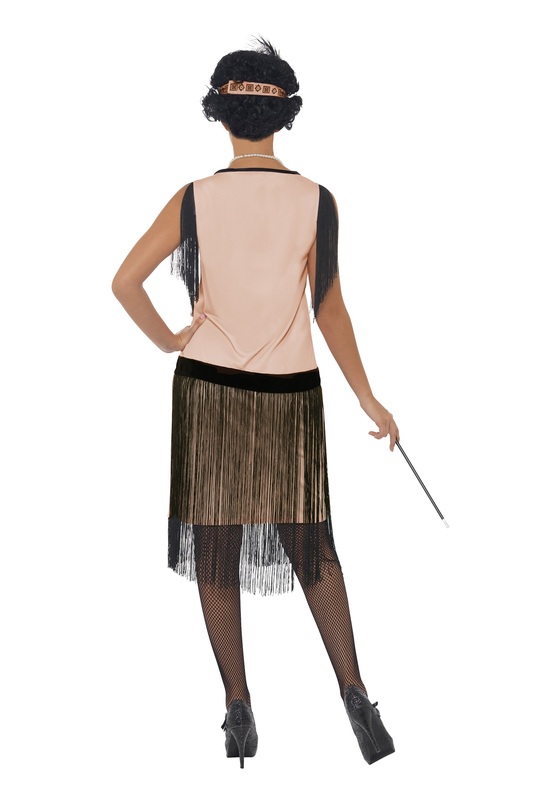 If you want to be a 1920s fashion icon, wear this Women's Plus Size 1920s Coco Flapper Costume! It's inspired by the designs of the French fashion legend Gabrielle "Coco" Chanel. Wear it for any 20s or Gatsby-themed party, and you'll be in the rotogravure! And let’s be honest, who doesn’t want to walk among the elite class in the 1920s. After all, they were having all the fun at their extravagant parties! This unique women’s plus size flapper dress is perfect for that elite party or a Halloween night out. The costume comes with a pink, dropped-waist pullover tank dress. The dress has a black velvet waistband and neck edging to make it stand out in the crowd. The bodice of the dress features a black geometric Art Deco print and the skirt is covered with long black fringe that hangs from the waistband. The costume also includes a matching headband that fastens with Velcro for a comfortable fit and it also has a 10” black feather that fits into a pocket on the inside. Complete the look with the included pin-on brooches that are silver-tone metal with faux pearls and a 13” long black cigarette holder. Now all you need is a pair of dancing shoes and a suave gentleman at your side!